I understand that rents are high at Airports, but it is like robbery to charge as much as they do for a small slice of pizza like they do. If you are going to charge this much (which is even more then Di Farra's in Brooklyn charges), you should at least use real cheese and give something that at least mimics decent quality. The dough was soft, soggy and tasted like crap. Not that I have ever tasted crap I should note. 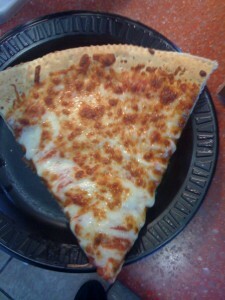 The cheese tasted like the kind you find at Cici's Pizza Buffet, and the sauce was almost un-edible. I would never get a slice here again. Even if they cut the price in half! This is the only Chicago Style pizza I have had that was thin and tasteless. Nicks Tomato Pie should step in here, and teach them how to serve quality pizza, at a fair price, while still being at an airport. Maybe their regular locations are better, but the airport Mangia sucked. Mangia Pizza at the Austin Airport gets 1 out of 8 slices.